I am sure you already know this, but the ability to cache food on the Wonderland Trail will save you a ton of weight/volume if you are doing it in three days. Depending on your schedule, entry point, and assigned camp sites, you may only need to carry a day of food at a time. I did the Wonderland last year in a comparitively sluggish 6 days and carried 2 days of food at a time. Have a great time! hey Mike how've you been ? you could easily shave 8oz if you tough it up and swap the neo for a half length trimmed CCF pad. shave another 3-4 by going stoveless … but yes I know sometimes this luxury helps moral. Art- have been really good. Got me heel healed and have been 100% all summer, lots of great running in (few nice backpacking trips too! )- how about you? I've got several ccf pads floating around, I might have to experiment, would definitely shave some weight- I get spoiled by that inflatable :) I'll also have to see volume wise on a ccf, the neoair rolls into an almost coke can size. The stove will likely stay, something about a warm meal in the evening and hot cereal & coffee in the morning…..
Yeah it would be nice to leave one jacket home, funny I was thinking about leaving the rain jacket and keeping the windshirt :) I do have one of those 1 oz rain "jackets" that maybe could be used in a pinch?????????? I prefer my ccf pad on the outside of pack because it makes the pack to rigid against my back when inside, but some like that rigidness. the thing about keeping the rain jacket instead of the wind shirt is it will keep you dry longer and also keep you warmer in really bad weather. for me its sort of a survival piece. John and I did Rae Lakes Loop in a day back in July, fun Sierra trip. I will be doing a three day hike on the wonderland in about a month following ALDHA west, can't wait. 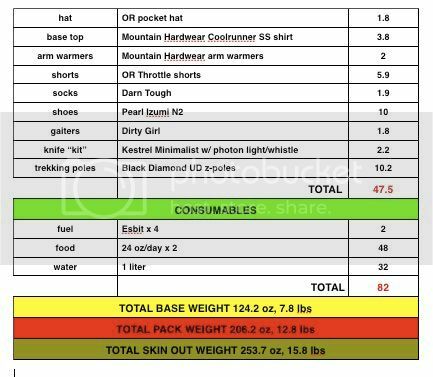 I will be carrying about the weights gear as your list but I will be using my little Burn just as I have on all hikes no runs for years. The main pack is about 25L which work great to expand for longer duration trips up to about 5 days, 7 in a pinch. 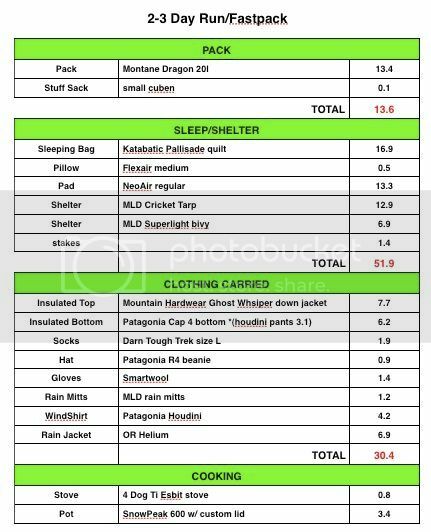 I could jam everything into a 20L but that violates my "no hassle rule" because it is quicker no easier to have a bit more volume for a multiday run/hike. The biggest target to me is your shelter if you are set on losing weight. You could lose the bivy altogether, especially if you had a slightly larger tarp. I rarely bring a bivy, especially when I am up off the wet ground on a cushy neoair. For example, a duplex tarp is 9 oz and seems to provide enough coverage to allow you to forgo the bivy. That would save you about 10 oz. I know, its $375 for a new duplex. But you might get by without a bivy with your cricket; I just don't have much experience with it. I typically carry a cuben trailstar and almost never take a bivy. I will only throw in the bivy if I'm expecting cold, windy weather. You could probably get by without the Cap 4 bottoms, rain mitts, and windshirt on lots of trips. If its just 2-3days, you have a pretty good idea of the kind of weather you're going to have. If you aren't night walking, you can save about 2 ounces on the headlamp. If you're doing 30+ miles days on the Wonderland, I'd skip the down jacket. At that pace, I'd stay warm moving and use the quilt to wrap up in if need be. I'd keep the rain shell and ditch the wind shirt. I'd keep the headlamp for sure. You are much more fit than me but it'd be dang tough to hike a 30 mile day on the Wonderland without some night hiking. I'd ditch the bivy for a polycryo ground sheet and head net. You can of course tie the corners on the ground sheet to use it as a bathtub floor. Depending on when you go, there are sections like Indian Henry's Hunting Ground where you'll definitely wear the head net as you're hiking. Yes on the food drops. Use the drop at White River instead of Sunrise. Mowich can be a PITA and you have to rely on the rangers to deliver the food from the Carbon River station. For three days, I'd deal with the extra 24oz and just skip that one. Longmire should be fine but I haven't used that one as a food drop. I believe you have to hit it during business hours. I'd skip the cap bottoms too and just sleep in your clothes. Depending on when you go, Panhandle Gap can be sketchy. Time it so you cross mid day. Water is plentiful except for the 6ish mile leg between Indian Bar and Nickel Creek. In normal <60* temps that's not a problem for me with 1L but I crossed in >85*, killed 2L, and was parched when I reached Indian Bar. At the very least, carry an extra liter for that section and toss it in the recycle bin at White River or Longmire. Art- shoot me an email when you get a chance on Rae Lakes- it's on my to do list! I'm not familiar w/ the Wonderland, what's sketchy about Panhandle Gap? "I'm not familiar w/ the Wonderland, what's sketchy about Panhandle Gap?" It's the highest point on the Wonderland and you have to traverse a snowfield. It was no big deal when I crossed it midday and in September. It's steep enough that when the snow is hard, a misstep could ruin your day. Over all not a big deal but something to keep in mind and best to cross it later in the morning if possible. I've never tried the Cricket but I was fine with my Hexamid Twin during a couple rain storms. I'm bringing my Cuben Grace Solo this year. I'm going to tie off the corners of the ground sheet and lift them off the ground. I have a head net but the mosquitos tend to disappear at night and aren't bad in September. The Longmire food cache does need to be picked up during business hours. The White River cache is in a bin behind the Ranger Station that can be accessed at any time. We entered and exited at Mowich Lake, so I don't know how well that one works. There is a section on the Rainier NPS web site about food caching, and they are happy to discuss it if you just call them up. Generally, I have found the Rangers at Rainier are really good to talk to. As for the pad, I love my NeoAir X-Lite in size small. It makes for a great 8oz inflatable torso pad for me at 6' tall. So if you are like me and reluctant to let go of the comfort of an inflatable, it is a nice option. Ian or Ed- is there a preferred map(s) for the Wonderland? Ian-do you tie the corners of the ground sheet to the tarp to lift the corners? "Ian or Ed- is there a preferred map(s) for the Wonderland?" I have both the Green Trails and the Nat Geo maps. Both are fine. Only issue I've seen with the Green Trails map is, as a courtesy, they note the mileage between points. There are a couple sections where they are off. Way off. The scale is fine so if you take the time to measure it on your own, you'll be fine. Nat Geo Map is what most of the rangers carry (at least the ones I met). The only place where I got screwed up, and it shouldn't have been difficult, is crossing the river in a counter-clockwise direction at Box Canyon. I hit an intersection that didn't have a sign. Turned out all I had to do was walk along the road across the bridge and the Wonderland Trail resumed on the other side. Anywho, I worked through it by using the Gaia app on my iPhone. I downloaded the entire MRNP prior to the trip which allowed for me to zoom in on a USGS map in much better resolution than the Nat Geo map provided. "Hiking the Wonderland" has good information about the mileage and elevation gained/lost between points. The rangers can give you a copy of the elevation profile of the trail. It's a good reference for anticipating your ups and downs of the day but some of the climbs appear worse on paper than they are in reality. For example, hiking Cowlitz Divide in a counter clockwise direction appeared to be a nightmare on paper but was a slow, long, steady climb in reality. No big deal. I'll upload a copy of it as a .jpg when I return mid September. "Ian-do you tie the corners of the ground sheet to the tarp to lift the corners?" Yes. A BPL member Randy (Cain?) posted that somewhere and it's an excellent technique. I've used the thermal sheet as a ground sheet and it worked fine although the rain we received on that trip was minimal so I can't claim long-term experience with it. I do have a zpacks twin bathtub floor so I may just bring that instead as I can roll up in it if need be. I have a few days to make the decision. Figure I'd discuss these in better detail. Longmire was answered above. Apparently you have to pick up your food during business hours. I had problems at Sunrise last year. Long story short, I previously mailed my food to hike the Wonderland with my daughter but had to reschedule after she twisted her ankle. Multiple phone calls with the rangers and when I returned weeks later, Rangers at Longmire assured me that my food would be waiting for me in the box. When I arrived, no food bucket. There is a ranger office located there that is only used on a as-needed basis. There wasn't anyone there but I got lucky when a ranger made an unscheduled stop and was able to get my food bucket from their office. Also, while not a huge detour, Sunrise is off trail and adds a mile to your trip. White River Ranger Station/Campground is only a couple miles away from Sunrise. I'm using them as a food drop this year. I figure if I run into trouble and for some reason my food didn't make it into the box, I have a better chance of finding an employee to resolve the issue. I'll post an update if this turns out not to be true. There are potable water sources at White River and real toilets so it's a nice place to take a break anyways. The food box at Mowich Lake is supported by the Carbon River Ranger Station. They are pretty good about making sure the food boxes are there waiting for you but sometimes they don't make a trip for a couple days. Because of limited space, they are quick to pull your bucket out of the box and return it to Carbon River if they think you're going to be a no-show. Carbon River Ranger Station is far enough away that you'd need to hitch a ride to get there. Last year there were hungry hiker buckets at the food drops. You could feed a small army with just the Mission Tortillas that were in the buckets. 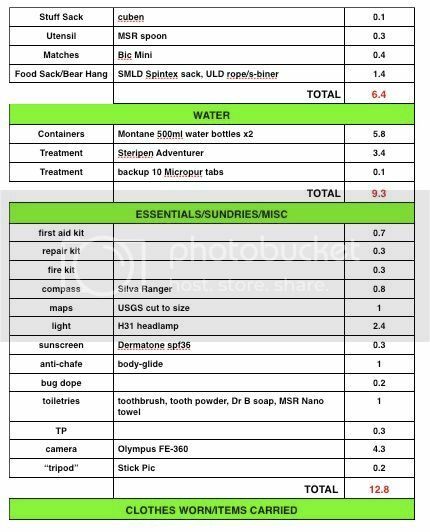 If push comes to shove and there is a SNAFU with your resupply, if you come in September, you could easily show up at the Wonderland without any food whatsoever and just live off of the hungry hiker buckets. Not saying you should, but you could. Button compass and terrain association *should* get it done but there are a couple areas where the signage is confusing and I had to shoot an azimuth down the trail, compare that to the map, to ensure I was going the right way. Yes. There are a few areas where the trail is not always distinct or is snow covered (Panhandle Gap was in the news recently) A compass and an altimeter can be very useful, a little fog (not uncommon) and they become essential. As for the torso-length CCF, I use one but I supplement with an 1/8" thinlight pad and sometimes my pack as well for the legs. Adds more weight of course, but it's still lighter than the neoair. Sounds like space might be a more important concern in this case, though.